Vlad from USA. Sent 25 May 2010. Went there as the store was opening so place was rather quiet, but I ended up striking a conversation with the owner Tony, a fantastic dude to talk to. 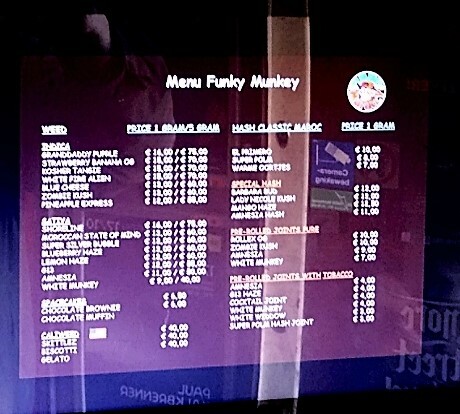 I was recommended their speciality, the Funky Munkey grass, and at 8 euros a gram it seemed like a great deal. I was completely right, it smoked fantastic and smooth, was light and left a great high after. The owner Tony had a ridiculous amount of stories about the history of Amsterdam coffeeshops among many other things, complained that the coffee in the States was beyond horrible, and even offered a coffee on the house. Inside is very big and lots of place to relax. Overall a fantastic coffeeshop, great staff, great prices, great product. Would highly recommend. Simon from Denmark. Sent 1 Jun 2004. This place is formerly known as Aggies, The bartender was very friendly and I had the Aggies Special, which is one of the best Moroccan hashes I ever have tried. The prices are cheap, and they have internet and different games.